The new metrics and logging solution is built around the Elasticsearch, Fluentd, and Kibana (EFK) stack, the same stack used by Red Hat OpenShift Container Platform. The new metrics store provides much more functionality and details on the RHV environment than was available previously. Open Virtual Network (OVN) has been integrated with Red Hat Virtualization to deliver a native SDN solution through the use of Open vSwitch. It provides automated management of network infrastructure, a Neutron compatible API for external network providers, and network self-service for users, which liberates network administrators from infrastructure requests. When RHV 4.0 was released in August of 2016, it showcased the new dashboard tab as a new way of viewing essential resource utilization within RHV as well as how virtualization administrators will interact with RHV in the future. RHV 4.2 has made significant strides in furthering these UI updates. This is a native site-to-site failover solution. Instead of integrating with a specific storage vendor, it depends on storage at both sites that can be replicated reliably and consistently. Under the covers, Ansible is used extensively to automate the failover and fallback process. The RHV 4.2 release provides a new virtual machine type called High Performance when configuring VMs. It is capable of running a VM with the highest possible performance, as close to bare metal as possible. This greatly streamlines the process of configuring the characteristics of a virtual machine over the previous manual-only methods. Example: Cisco ACI Integration. Cisco ACI provides overlay protocols that support both physical and virtual hosts in the same logical network even while running Layer 3 routing. This integration provides additional options for customers, especially those that use Cisco ACI as part of their infrastructure. The Ceph iSCSI target has been tested and certified as a storage domain for virtual machines. This provides more infrastructure and deployment choices for engineers and architects. Check that hardware meets all system requirements. A public network connection will be used to register and to download and install software. Burn the ISO image to DVD or create a bootable USB medium, which will be used to install the Hypervisor. Download and install the latest version of Red Hat Enterprise Linux 7. Register using Red Hat Subscription Management and subscribe to the necessary entitlements. Read Enabling the Red Hat Virtualization Manager repositories for full details. Using YUM, download and install the RHV packages. Run the configuration script to install the Manager and Data Warehouse (DWH). Copy the ISO image to DVD or create a bootable USB medium to install the hypervisor. Boot from the RHVH ISO image media and install the operating system (this media can be used to add additional hypervisor hosts later). Configure datacenters, storage, clusters, networking, and hosts. Read more at Administering RHV resources. Attach an ISO domain and upload ISO images. See Preparing and Adding NFS Storage and Populating the ISO Storage Domain for full details. Connect through a web browser to the RHV portal using the URL specified during configuration. Register the host. Read Enabling the Red Hat Enterprise Linux host repositories for full details. 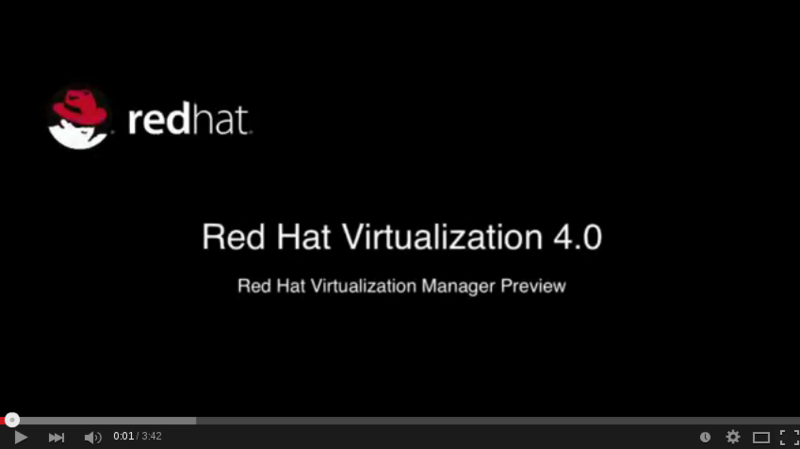 A demonstration of the new Red Hat Virtualization Manager for 4.0. 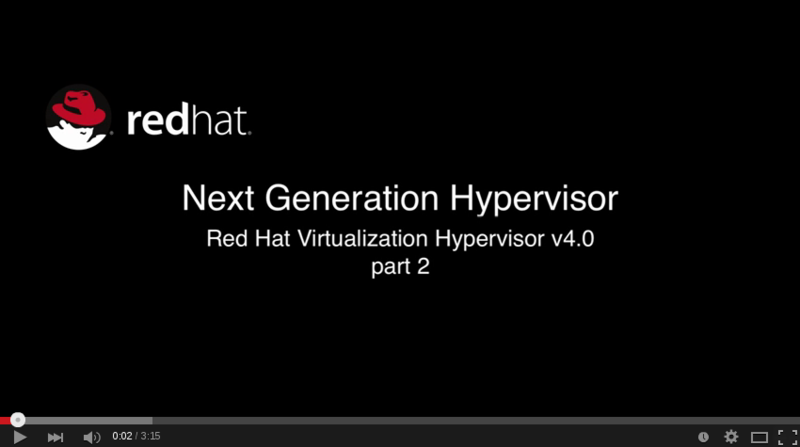 A video screen demonstration of the installation and configuration fo the new 4.0 Hypervisor. See the Hypervisor complete the update and see the Cockpit host admin console in action. Red Hat Virtualization 2: three years of Production Phase support. 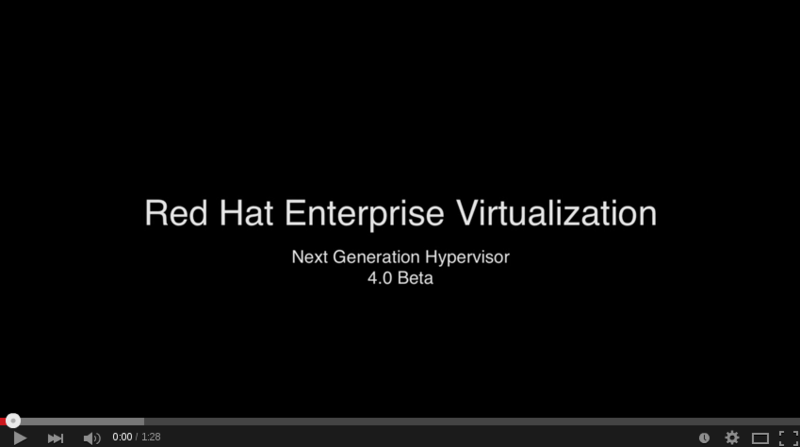 Red Hat Virtualization 3: five years of Production Phase support.